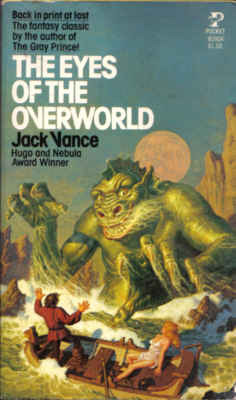 Jack Vance was enormously influential on OD&D. Spell names notwithstanding, his entire Dragon Masters setting was turned into a series of detailed monsters in All The World's Monsters, and he was friends with some of the OD&D DMs and players on the west coast. Looking at the old material, between 1977 and 1979 a wave of things were published all of which are influenced not just by Vance or bits and pieces but specifically by the Dragon Masters itself. Booty and the Beasts with its technological marvels, ATWM as previously mentioned, and some of the games described in fanzines all seem to indicate that perhaps the Hugo winning Dragon Masters was in fact an ur-campaign and it was definitely an ur-setting. The statistics provided in ATWM literally go through each and every permutation from the book. Interestingly ATWM also has many stats from other science fiction novels, and matching stats to the authors indicates a core of west coast gamers who were definitely running OD&D as science fiction / science fantasy. Errol Otus' work is very Vancean. I have tried, but I haven't really been able to get into Vance. What is the Dragon Masters world like? Would it be possible to turn it back into an OD&D setting? I find it interesting that you are drawing comparisons between Vance's fiction and Erol Otus' art. Could you give some examples? Otus drew a whole series of things that are much like the Dragon Master world weapons. Dragon Masters would be an easy world to create as a setting. The novel is very clear on what is going on, you have the nice twist that one side if humans breeding dragons and the other side is dragons breeding humans, and All The World's Monsters contributors literally wrote every significant entity up, including charts for types of tech weapons and so on. Other than that it's a world of factions, noble houses, strongholds and battles. It's quite OD&Dish from the get go - or vice versa. I will abstract all the Dragon Masters stuff I can find from that period into a single document and we can work from there. Havard wrote: I have tried, but I haven't really been able to get into Vance. Have you tried Eyes of the Overworld? It's my favorite of the Dying Earth stories. Eyes of the Overworld is magnificent in every way. In fact the Vance written Cugel stories form a fantastic sequence, beginning to end not least the "back to the beginning" part. Don't want to spoiler anyone, but for goodness sake if you've never read them - do yourself an enormous service and get reading! Then be truly stunned at how similar Vancean worlds are to D&D especially of yesteryear. Havard, if the old Vance stories don't get you interested, try the Lyonesse series (Suldrun's Garden, The Green Pearl, and Madouc). Much more recent writing, though a much more classic form of world. The writing is clearly a case of Vance influencing fantasy gaming, which then influences fantasy fiction, and that fantasy fiction influence being re-integrated by Vance. The entire storyline is a near-perfect rendering of a bildungsroman D&D fantasy style. There was even a French RPG based on it. Sadly, never got translated to English, AFAIK. But the maps of the Elder Isles the game produced were magnificent, and can totally be used for a D&D campaign. Dragon Masters is a strange, distanced science fantasy with a very arch style and intentionally cold and unlikeable characters. It is rather brilliant but in no way reminded me of D&D although it could be adapted the tone is far more sf than fantasy. The Dying Earth, Eyes of the Overworld and Lyonesse are slightly more reminscent of D&D (in that they are fantasy) but Vance's tone is very satrical and ironic which I don't detect in early D&D or AD&D material. I totally agree there's no irony in AD&D, in fact for me it is defined by its joylessness and ponderousness. But ironic or not, the Dragon Masters was used as a default setting by many west coast first generation OD&D gamers, as witnessed by the profusion of writeups in the first generation (pre- AD&D monster manual and DMG in fact) publications and zine articles. That was the vibrant original west coast gaming scene for OD&D and Jack Vance was central to it. The early booklets people put out are ironic in parts but as most were written by 17-19 year olds they are more cruel in tone and embrace Vancean baroque elements as well as the destructiveness of Vancean weaponry, another overlooked feature of his work. The Otus produced Booty and the Beasts has a section on very Vancean technology (along with a Slaver weapon which comes directly from the Star Trek cartoon based on its appearance). You're certainly right about the influence, I just found a Dragon Masters write-up with stats in White Dwarf #6! I've long wanted to check out Booty and the Beasts. All the World's Monsters has writeups of all the Dragon Masters creatures.